Your vehicle is designed to need a minimum of maintenance, so once you choose a garage to look after your car, the same ethic should apply. You want people you can trust to do the job properly. People that can give you answers to any problems you may be experiencing then offering you the correct solutions. In other words, the minimum of maintenance with your garage, as well as your vehicle. When your high performance needs servicing, we can supply the worry free maintenance you are looking for. Our unique Condition Based Servicing (CBS) technology means that your BMW has the intelligence to monitor its own condition and pre-warn you when a service is due. 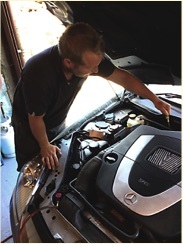 At Hillside Motor Works we have over 40 years combined experience working with BMW and Mercedes vehicles. Our reputation is built on cost effective and thorough service programmes that will keep your vehicle at the peak of its performance throughout its lifetime. Complimenting our range of servicing programmes we also offer Routine Maintenance Check, Tyres, Valet and Air conditioning services, all of which are designed to keep your motor in pristine condition.  We are able to offer dealer-level diagnostics & coding, and performance tuning from one of the worlds leading diagnostic equipment companies - Autologic Diagnostics. 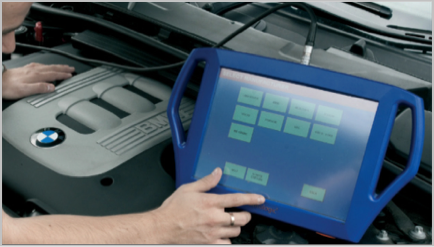 This highly sensitive equipment enables us to quickly diagnose and efficiently detect any any BMW / Mercedes system faults. All work is carried out by Fully Qualified Trained Technicians with fully integrated state of the art tooling and equipment in order to complete work on your vehicle to the highest standards of excellence. Why not give us a call next time your BMW needs a service.